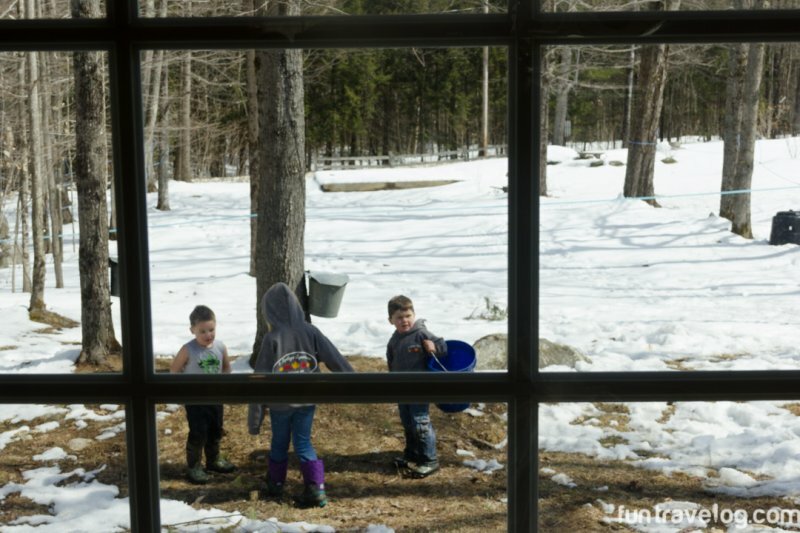 It is often tricky to distinguish between winter and spring in New England. 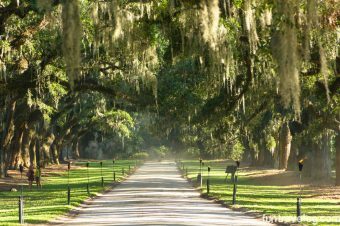 Locals consider the seasons in this region to be thoroughly distinct from each other. And rightly so. 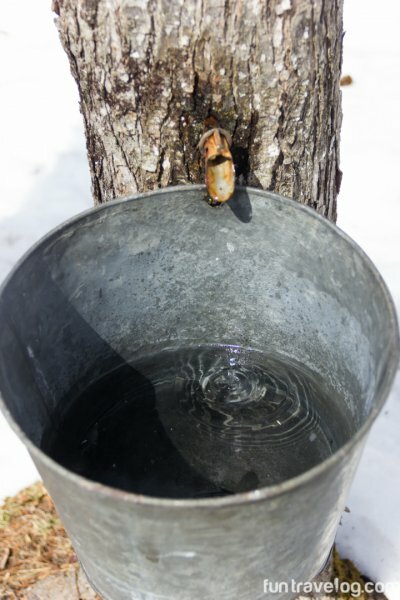 The running of maple sap between late February to mid-April could be considered nature’s way of indicating a seasonal transition. As temperatures soar to mid 30’s Fahrenheit during the daytime, maple trees convert starch produced in the summer to sugar. 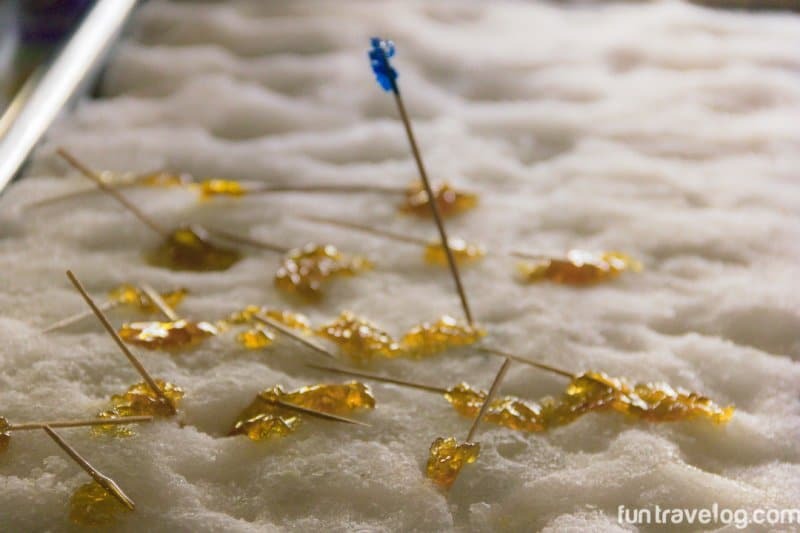 This sugar travels along the tree trunks as sap. Maple sugarmakers collect this sap and boil it constantly to produce a thick syrup. Maple trees have been around in Canada and New England for decades, which makes both locations prime for leaf peeping in fall and maple syrup production in winter / early spring. 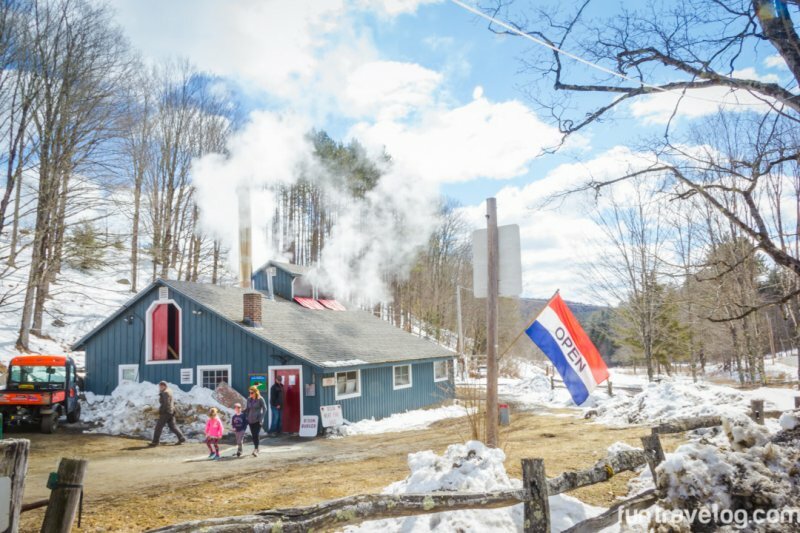 David Abbot Sr.’s sugarhouse is named after his five grandchildren who were busy running between a patch of trees being tapped in the family-run establishment. It was a surprisingly sunny afternoon which according to Abbot’s daughter Dara is a blessing for sugar makers. Dara helps manage 5 Saplings along with her father and brother. 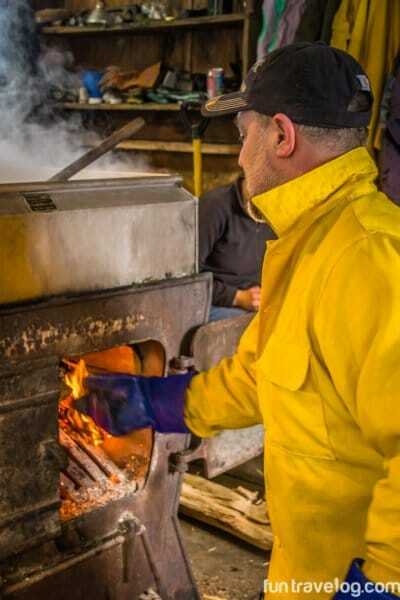 Once inside a sugarhouse, it is impossible to ignore the heavenly aroma of boiling sap. Tasting the warm syrup boiled earlier in a paper cup, I finally realized why the season is considered to be so special. Lighter than honey in consistency, the maple syrup was packed with a strong, sweet flavor. As I slowly sipped through, my memory made a u-turn to our family kitchen in Calcutta. 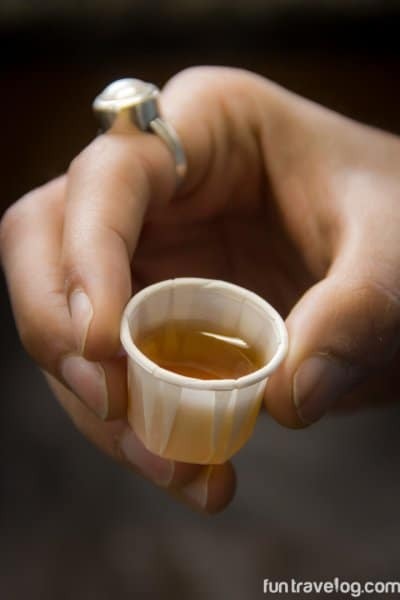 The thrill of tasting maple syrup was comparable to the countless times my grandmother has indulged me with chunks of gur or date palm jaggery. To my utter surprise, the two are produced in a similar manner, and hence the resemblance in taste. I hoped no one noticed as I tried to lick the remains at the bottom of the cup. Abbot Sr. then proceeded to outdo his own product by presenting us with a sample of maple cream. 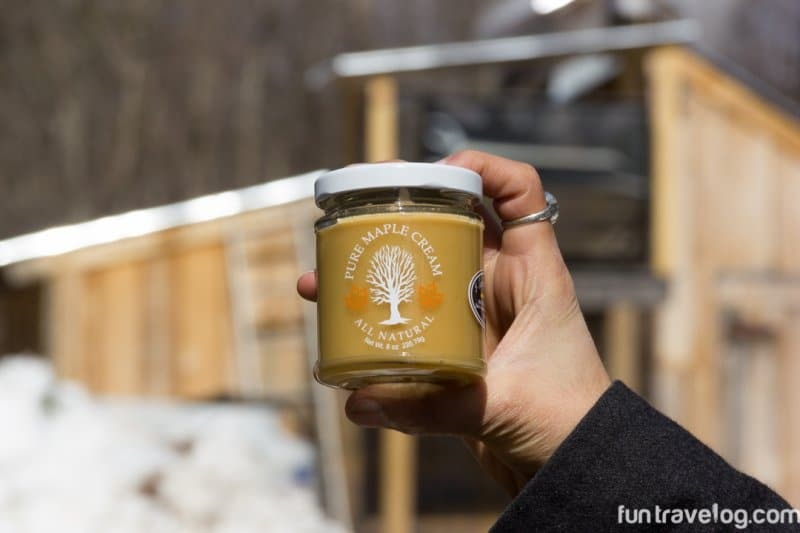 When the sap is boiled longer and at a higher temperature, it thickens and the result is a velvety maple cream. Could this get any better, I wondered. 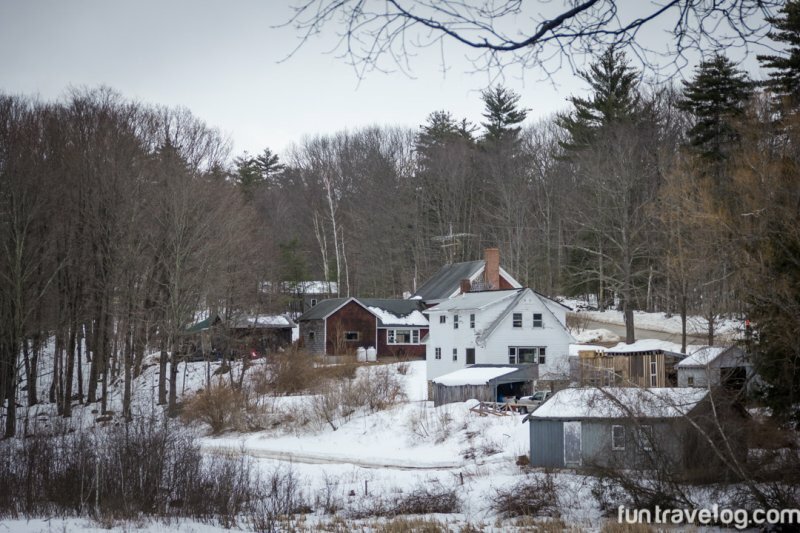 Further ahead in Moultonborough, the fifth generation run Abbott Farm seemed to be prepped for a festive affair. Friends, family and an excited dog welcomed visitors with helpings of maple syrup and pure maple candy. 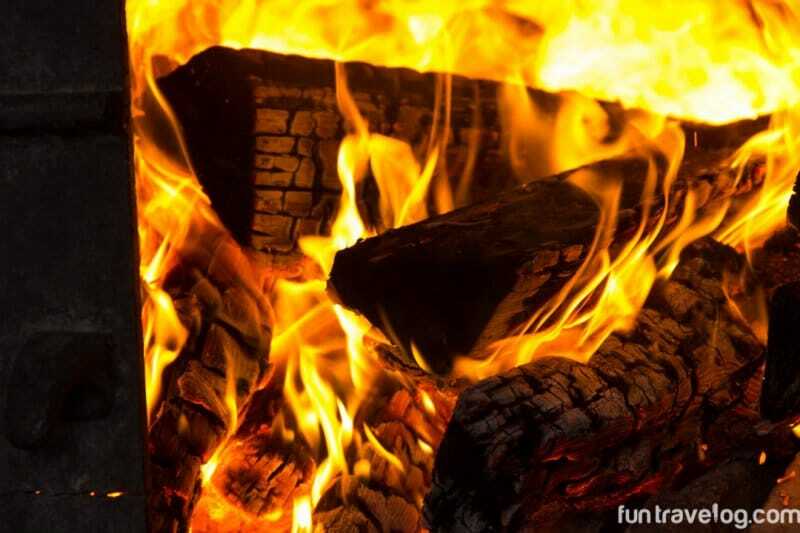 Every ten minutes, one of the owners would replenish the fire pit enclosed under the boiler with planks of lumber. 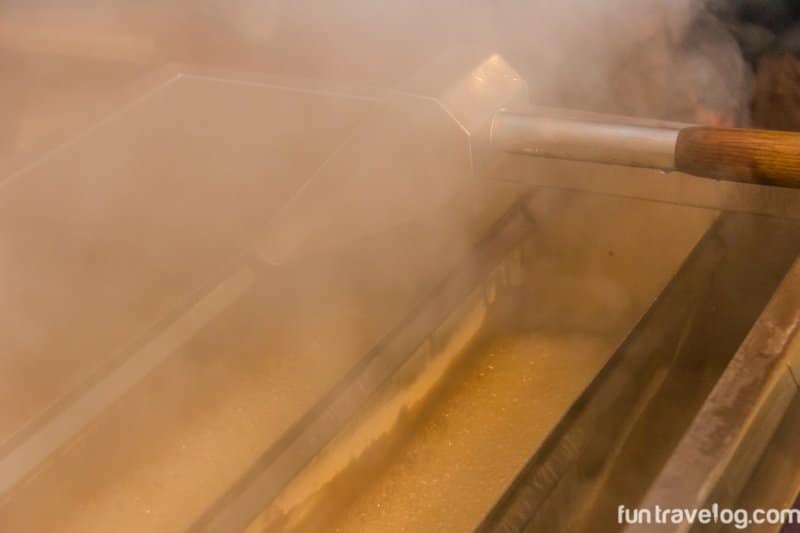 We noticed that sugarmakers preserve samples of syrup that they boil each day. 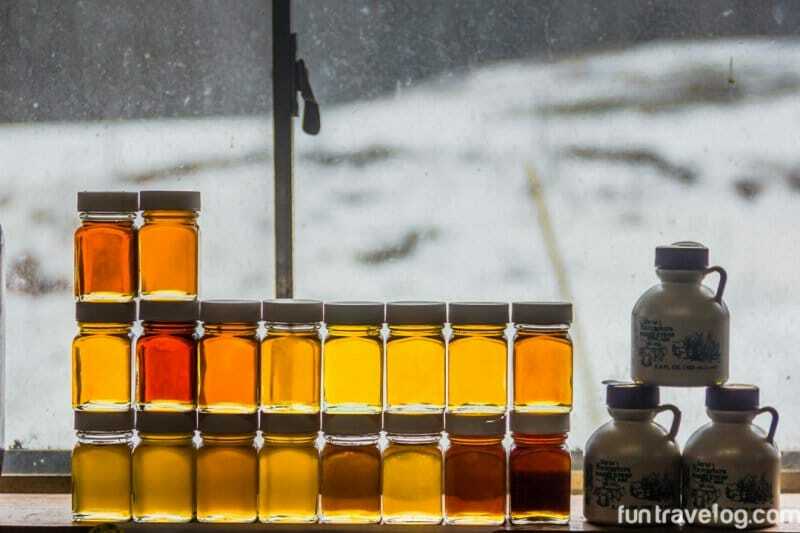 At the beginning of the season, the syrup produced is light in color. 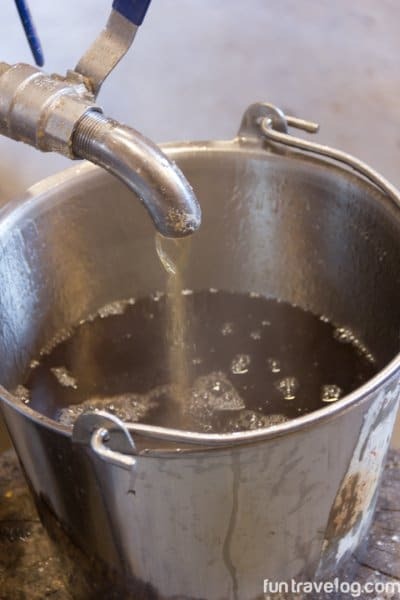 As the days turn warmer and nights cooler, the resulting syrup is much darker and more robust. Another family-owned estate, the owners of Clark’s sugarhouse had laid out a mini feast for their visitors. There were lots to choose from amidst hot dogs, pies, maple cotton candy, maple taffies, and maple coated almonds. The sugarhouse seemed to be popular with visitors. 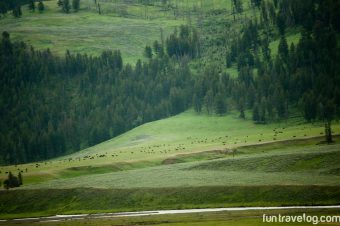 We sneaked out to see their bison farm nearby (Valley View Bison) and were amazed to notice how quiet and still the mammals were. Thus far, we had only visited family-run sugarhouses. A visit to Bascom Maple Farm was insightful in helping us learn about the scale and size at which the maple industry can operate. 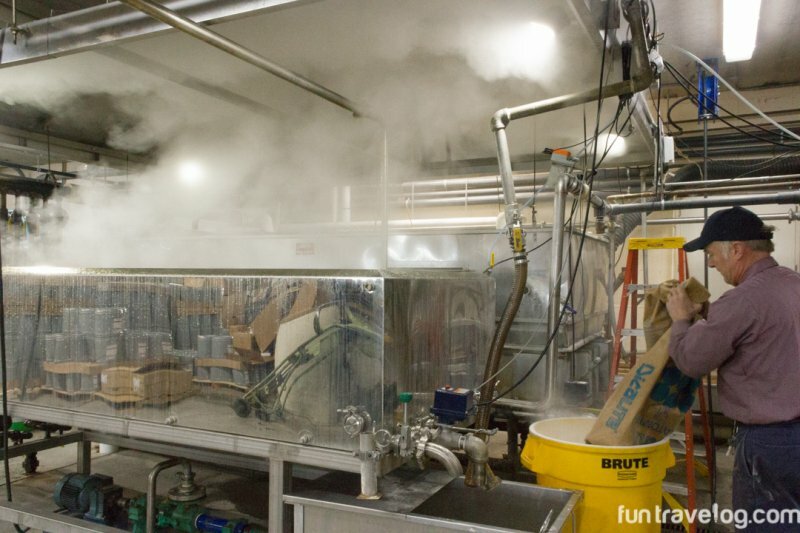 Bascom is a wholesale maple syrup producer and clearly functions in a highly sophisticated and synchronized manner. 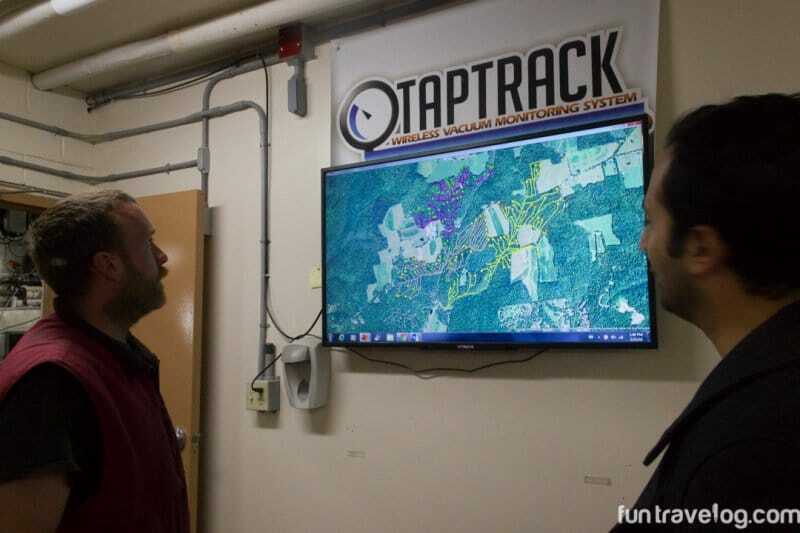 We were blown away by their ability to track the levels of sap in their maple trees through sensors. Fate seemed to have saved the best for the last for us. 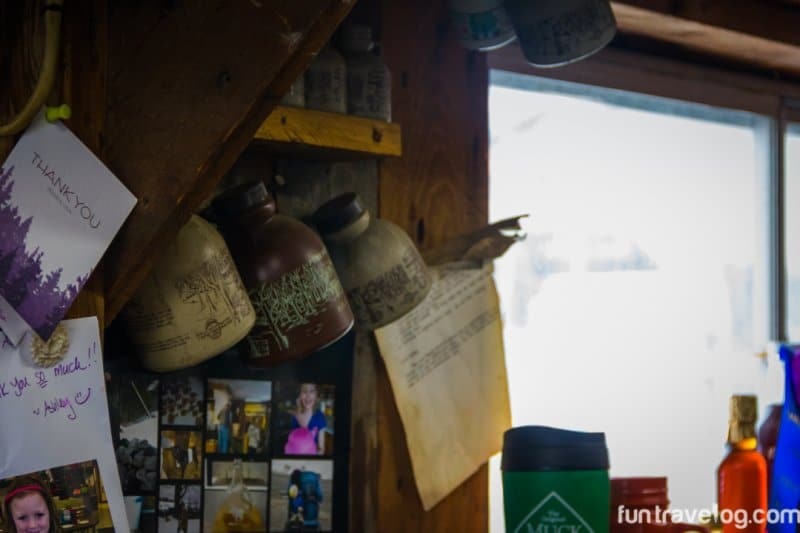 Mark and Kati’s small sugarhouse in Surry, NH truly showcased a passion for maple products. For starters, someone from their family guided every visitor through each step of the collection and boiling process, including making them sample fresh sap. Mark was also kind enough to walk us towards the trees and tell us about the differences in the two main types of trees: sugar maples (their leaves have five ends) and red maples (their leaves have three ends). The best part though? Tasting vanilla ice cream with fresh maple syrup. We toured these sugarhouses over a two-day weekend trip. We chose to stay in Center Harbor Inn for one night (which is also very close to Abbott Farm Sugarhouse). 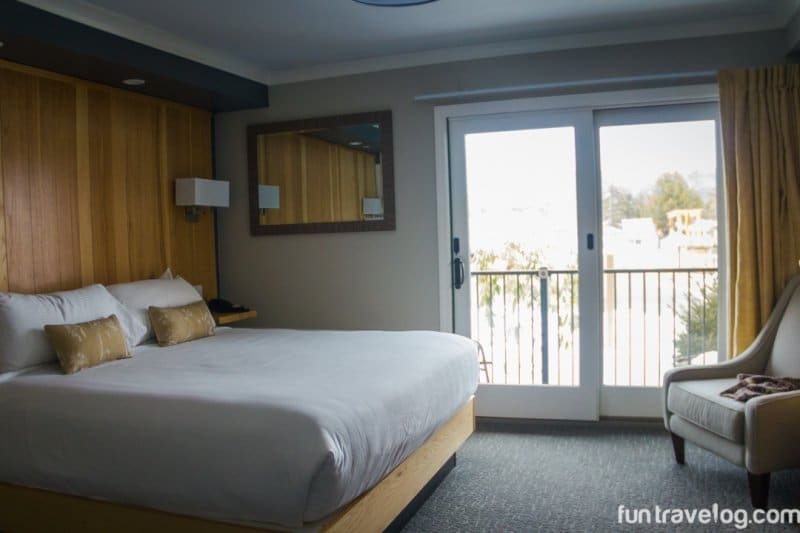 This Inn came highly recommended by our friend (follow her adventures on Instagram here). The open-air hot tub jacuzzi overlooking Lake Winnipesaukee was just too difficult to pass 🙂 Thankful for this decision! 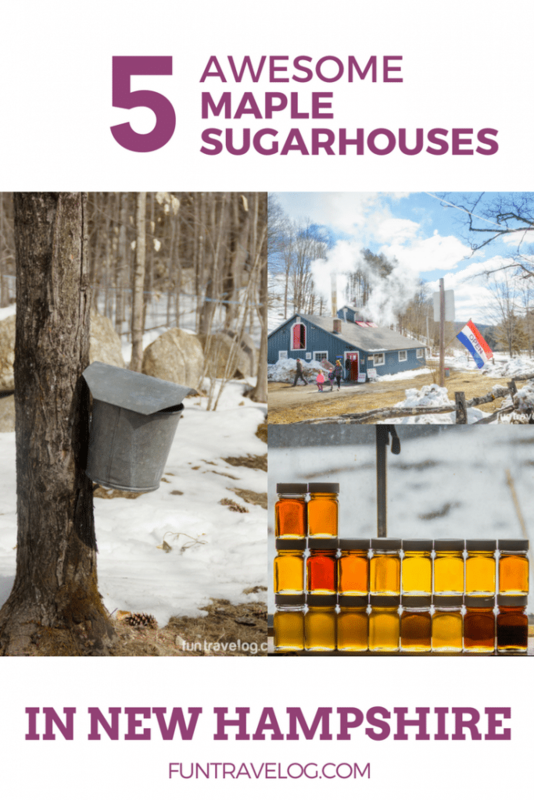 The NH Maple Producers’ site is a one-stop resource for planning and choosing sugarhouses based upon your routing. 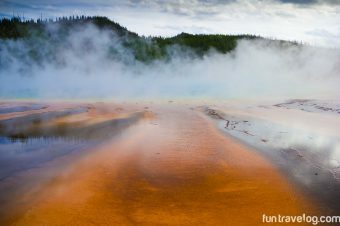 However, we loved this blog written by Robbie of Enchanting New England. In fact, we chose the last three sugarhouses from her recommended list. If we had time, we would have loved to stop by at more farms. If you cannot make it this year, sweat not! 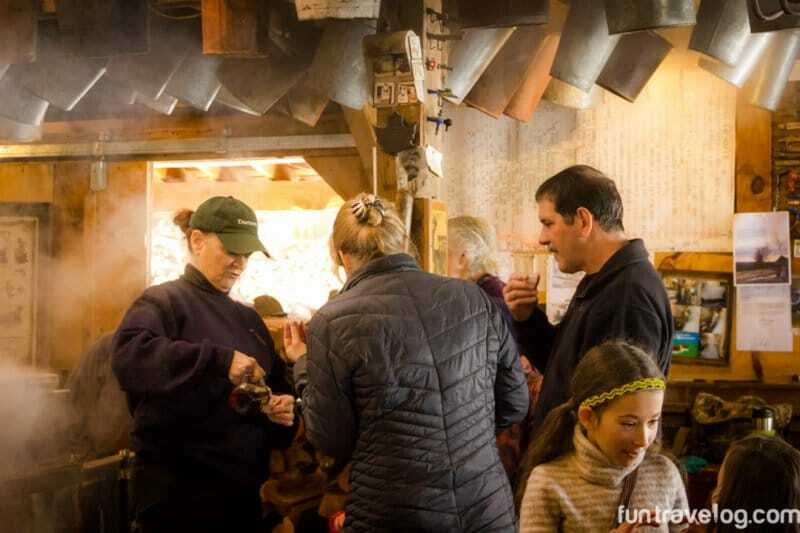 The Maple Weekend is organized every year in New Hampshire and Vermont. 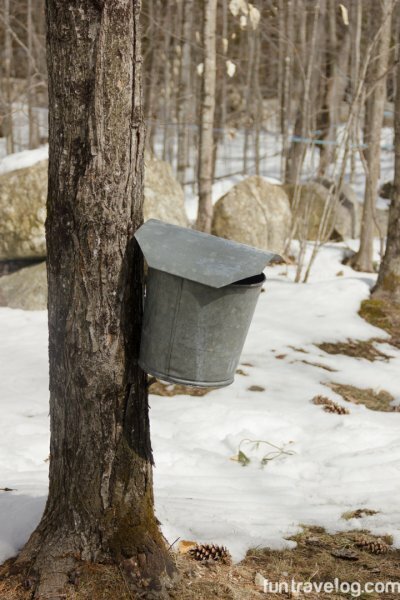 Be sure to bookmark the NH maple producer’s website for next year’s dates. 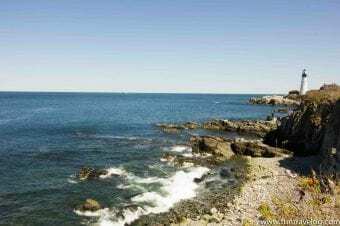 As my unaccustomed mind continues to struggle with New England’s temperamental weather, a part of me is already looking forward to another sweet adventure next year. 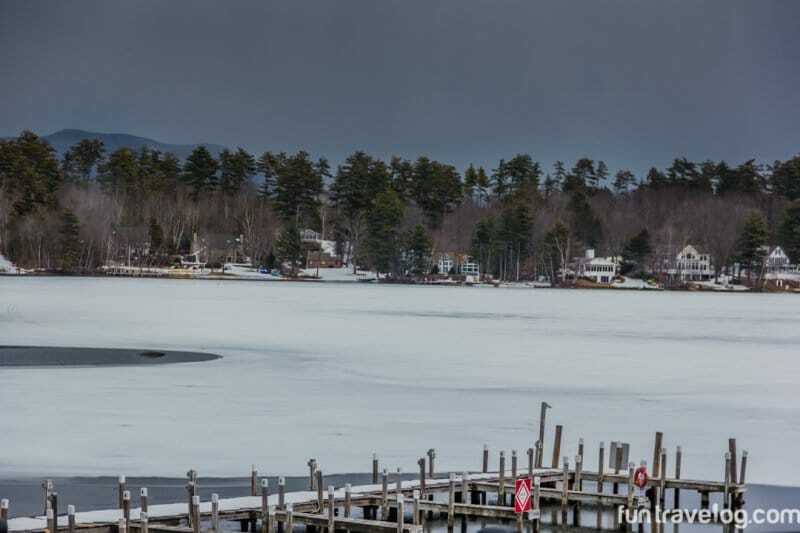 So I am not the biggest fan of the cold…but I would 100% go to New Hampshire for a Maple Weekend! 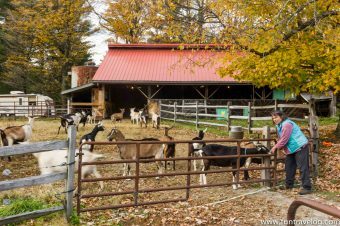 All of those sugar houses on the Maple Weekend tour look amazing but the food bonus at the Clark House in New Hampshire sounds like where you would find me parked for several hours! This is why we ended up staying at Center Harbor Inn, where we could just lounge in the hot tub and admire the lake. Luckily the weather was quite mild for the weekend we did the trip, so it was a win-win! I never made the connection between date palms and maple syrup but I could see it. You maple syrup ice cream reminded me of date shakes that I had all around Palm Springs. If you ever get a chance to have a date shake – do it. Super yum. Wow – that sounds delicious. Thanks for the recommendation. The connection between date palms and maple syrup was at the back of my mind and I knew I had to read up about it upon our return. 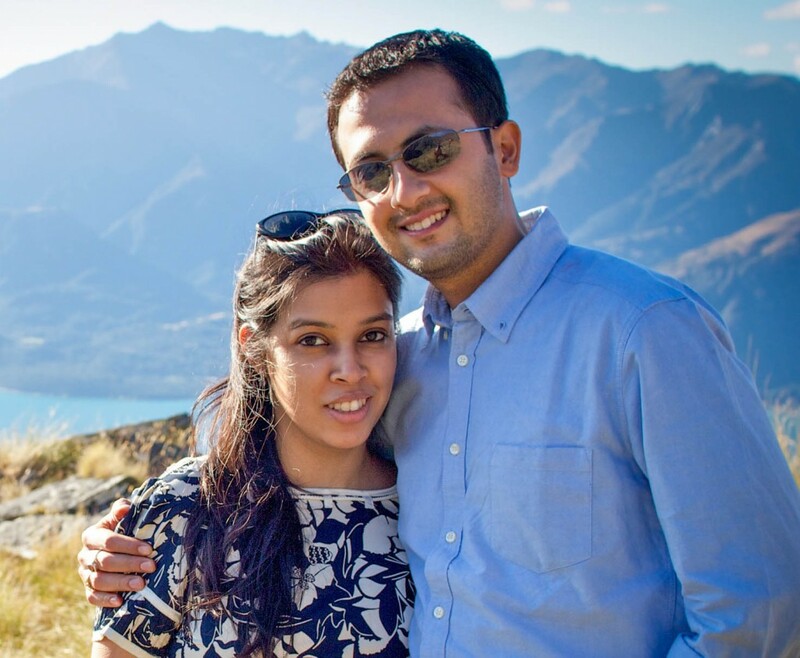 A sweet coincidence for us, especially having grown up eating jaggery in India! We were in Vermont and New Hampshire in 2012 but it was summer. Maybe that’s why we weren’t offered this tour. But now I know why maple food products are more expensive. But it’s always worth it! Fun and unique blog post that I really enjoyed reading! We were in Canada last fall and sampled many of their maple flavored products. I would love to tour maple syrup farms! One thing I’d never heard of before was maple cream — that sounds amazing! I’m going to keep my eyes open for some and buy it! 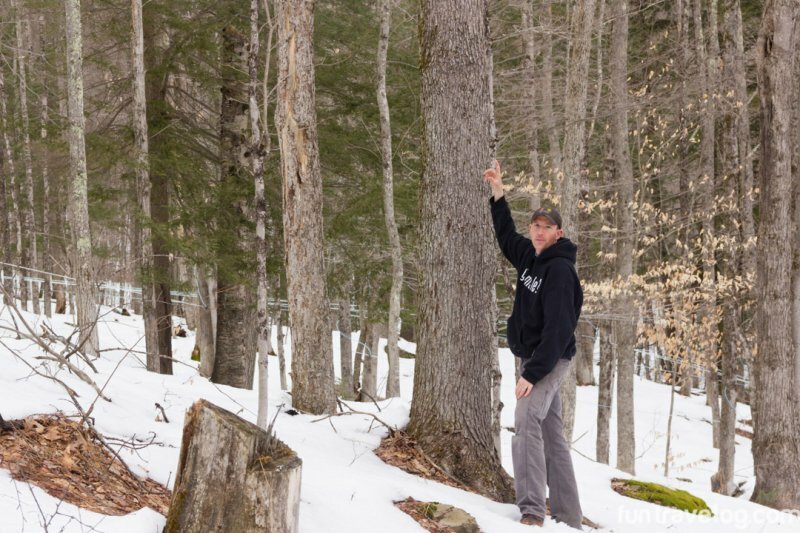 Where in Canada did you visit the maple producers? I have always dreamed of visiting this area during fall – looks like I must plan a visit during Spring as well to make it to all these sugar houses. Maple syrup is such a staple in our house – goes on oatmeal to pancakes to ice cream. I can only imagine how yummy it would be when you get it right from the source. 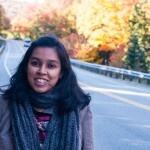 Hey Priya, then you guys must plan to visit the New England region in Spring. Fall is another reason too! Given that your fam loves maple syrup, this will be a great experience for all, I bet. 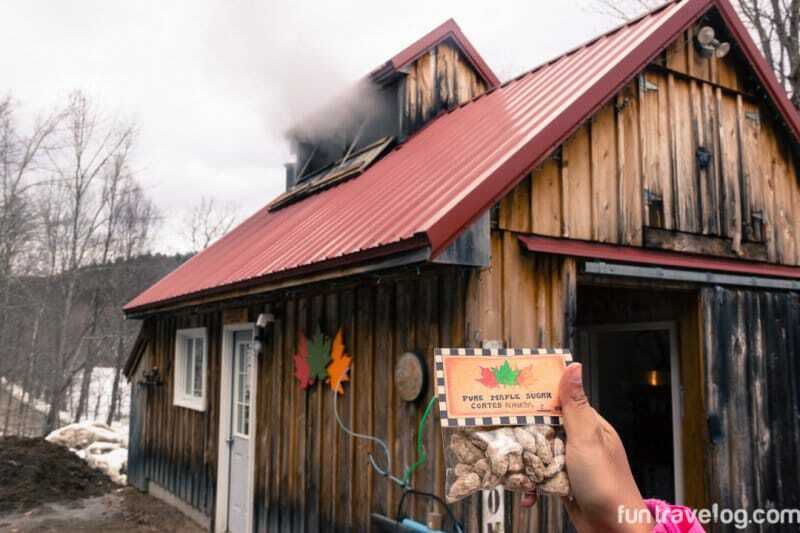 We were on the same boat like you Pola- until we made a visit to these sugar houses and tasted the fresh ‘tap to table’ syrup! Hope you can make this trip someday.